Step 1: Follow the path Shipment -> Book Shipment. Step 3: Click on Refresh Button to assure that recently updated Booked Orders are populated. 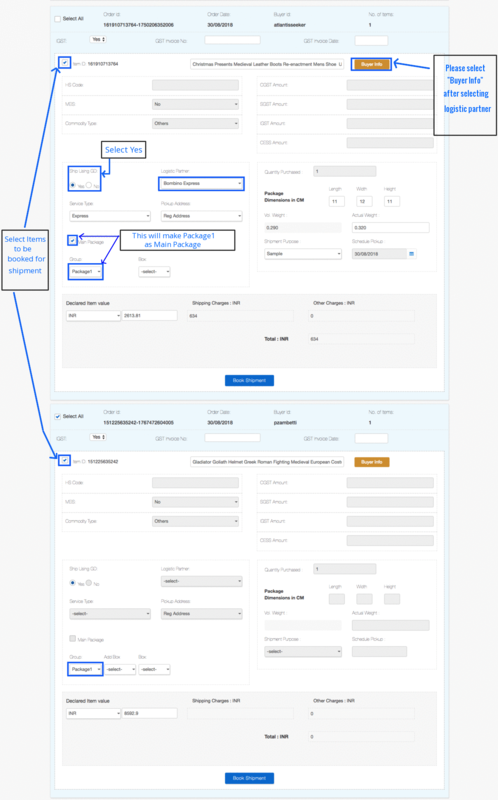 Step 4: Click on the Order that needs to be booked and the selected order will expand to fill details. Step 1: Click on the link shown in the above image to view the Buyer Information. Step 2: Click on the button ‘Edit Info’ to alter the information given. Step 3: Check the checkbox at the end to apply the displayed Buyer Info to all items in the current transaction. Step 4: Click on the button ‘Save’ to update the changes. Step 1: Select Multiple Orders and group them under the same package. Step 2: Selects one of the orders as Main Package. Step 3: The fields for all orders other than the Main Package Order will have their fields disabled. Hence, the seller will have to put the weight which is a summation of the weights of all items on the main package order. Step 1: You can group some of the items in the same Box and remaining items in other. Step 2: Consider the scenario where we have to ship three items. We will group two items in Box 1 and third item in Box 2. Step 4: Select Box 2 for the third item under package 1. Step 5: This will allow only one AWB to be generated. Only for FedEx Parent and Child AWB shall be generated. Step 2: For Example-Consider the scenario where the Seller is resided in Hanwood, Australia. Step 3: Seller clicks on the button ‘Rate’ which is enabled as soon as FedEx is selected as Logistic Partner. Step 4: Seller gets the additional amount charged by FedEx for servicing in the Remote Area. Step 5: Seller clicks on the button ‘Book Shipment’ and gets the success message. Seller clicks on the link ‘here’ to get the PDF. Step 1: It is possible that the Buyer information for City/State does not match with the Pin Code Entered. Step 2:Consider the following example of Buyer Information. Step 4: Rectify the address and then proceed.